SSD manufacturers are under constant pressure to reduce prices and increase capacity, but the pace of Moore's Law is never enough to satisfy consumers. As the SSD industry has matured, manufacturers have turned to other strategies for driving down costs, making tradeoffs to better suit what customers want. Early on, we saw a shift from single bit-per-cell SLC NAND to two bit-per-cell MLC, doubling capacity for the same size of chip (and therefore, cutting cost per GB in half). Currently, the industry is transitioning to 3D NAND techniques that allow for more storage capacity on a chip of a given size without requiring circuit elements and memory cells to shrink. Portions of the market are also shifting to use three bit-per-cell TLC NAND to get another capacity boost. None of these advancements in storage density come for free. 3D NAND requires major changes to the manufacturing process, which is why only one of the four NAND manufacturers is currently shipping products with 3D NAND. Likewise, cramming more bits into the same memory cell has reprecussions. The more closely spaced voltage levels in the flash cells requires more careful control and more complicated error correction. It makes reading and especially writing slower, drives up power consumption and decreases durability. Everyone in the industry has struggled to create TLC-based SSDs that can compete on anything other than cost. Samsung has made the most use of TLC, aided by their lead in 3D NAND, but their TLC drives have had issues that have proven tough to stamp out. Despite the difficulty, most manufacturers now feel that TLC has a place in the market and that the downsides can be mitigated enough to suit consumers. This brings us to Crucial's latest drive, the BX200. 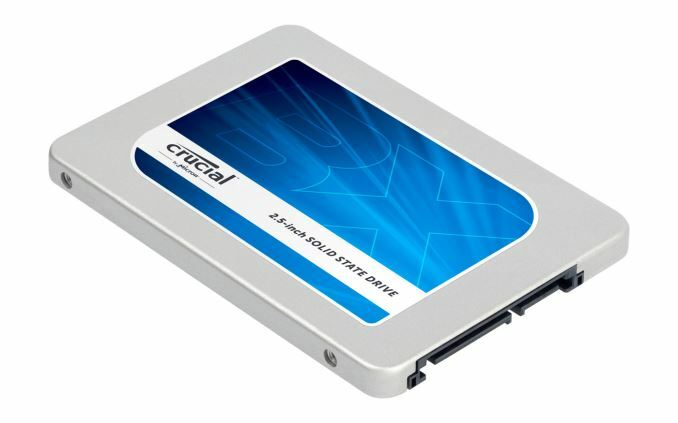 As the successor to the very successful BX100, it is a value-oriented 2.5" SATA drive. The BX200 moves to the newer Silicon Motion SM2256 controller and is Crucial and Micron's first TLC drive, using Micron's 128Gb 16nm TLC NAND. Micron's 16nm TLC was announced in June as intended for consumer applications. With a shift to 3D NAND planned for 2016, their 16nm TLC is something of a stopgap solution to further cut costs while temporarily stuck at the end of the road for planar NAND. Silicon Motion's SM2246EN controller has been a popular choice for low-cost client drives, and when paired with MLC NAND it offers decent performance and very low power consumption. While it technically supports TLC NAND, only the successor SM2256 controller supports the more advanced LDPC error correction that is widely viewed as necessary to get sufficient reliability from a TLC drive. There are now several TLC drives on the market using the SM2256, competing primarily against each other and earlier SM2246EN drives with MLC, and MLC and TLC drives using Phison S10 controllers. Further up the price and performance scale are mid-range MLC drives and Samsung's TLC-based 850 Evo. The BX200 specifications show only moderate performance increases over the BX100, except for the random read speed which is significantly decreased. The higher program and erase times of TLC NAND are probably the most difficult downside to mitigate, as SSDs have always been trying to compensate for their much higher latency than DRAM. Throughput can be increased by using multiple flash chips in parallel, but random read performance ultimately is limited by how long it takes the drive to fetch any data from the flash chips, so some decrease was probably unavoidable. With the BX200 Crucial is retiring the 128GB capacity class. As flash memory gets cheaper, the fixed costs of the controller and other components come to dominate the budget and smaller capacity drives end up costing more per GB than mid-range capacities. Additionally, the smallest capacities have the least ability to provide parallelism, which can hobble their performance. For most of the charts in this review, I've highlighted in blue the other TLC drives we've tested.